Don't be afraid to play with your hermit crabs. The more you handle your crabs the more they will begin to trust you. Always try to remember to move slowly around them since they have compound eyes and detect movement very easily. Always keep an eye on open claws and their relation to you. When something touches an open claw, it's a natural reaction or instinct for the crab to clamp down. When picking up a crab that you are not familiar with, hold the crab by the shell with the hand that you write with. Place your other hand palm tightly outstretched (no loose skin) just below the crabs walking legs so that its legs are touching your outstretched hand. If the crab tries to grab onto your hand, all you need to do is to gently lift him. If you hold hermit crabs in this way, they will feel much more secure and be less apt to pinch. Dangling a hermit crab in mid air will cause it to hold on in any way that it can, including with its pincher. 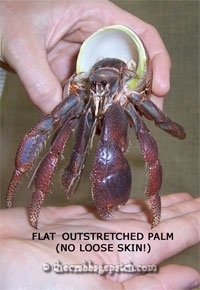 As you and the crab begin to trust one another, you may want to let him walk across the palm of your hand. It's like getting to know any animal; it takes a little time and patience. Most of my customers that have met me at the flea market are familiar with my love of hand feeding treats to my large crabs. I started this practice years ago using the long stem of a Bic pen top as a spoon. Now at The Hermit Crab Patch we're known for our Jumbo Feeder Spoons that we sell so that customers can carry on the practice. Food is an excellent motivating tool and the way to most anyone's heart is through his stomach, right? Yes, even a hermit crab's! People initially think it's a little strange to see me hand feeding a jumbo hermit crab tropical fruit baby food with a special spoon... However, the crabs truly respond in a way that can't be denied. In a matter of a couple of "feedings" I can take a crab that rarely comes out of its shell and turn it into a crab that will allow me to pet its tail. Hermit crabs catch on to hand feeding very quickly. They learn to associate handling with the reward of food and an amazing amount of trust is the end result. I highly encourage my customers to try hand feeding. It's a great way to bond with your hermit crab! Unfortunately as a hermit crab owner, it's just a matter of time...you will get pinched. There are ways to deal with it. My favorite technique is to attempt to coax the crab into walking off whatever he is grabbing a hold of. By trying to get him to move, he ultimately has to let go. Another technique is to run him under lukewarm water if you happen to be close to a sink. I had this backfire recently with a jumbo crab. He had a death grip pinch on my hand and when I stuck him under lukewarm water it scared him into pinching even harder. Most of the time crabs tend to let go fairly quickly. When allowing a crab to roam around outside of its cage, be sure that the crab is not in any danger. Hermit crabs can't see down like we can, so you want to make sure that they are not in danger of falling. They may not always sense the edge of a table with a single swipe of their antennae. Keep an eye on crabs around other household pets and young children. Also, make sure that crabs won't get into anything toxic, such as pesticides in the yard if you are allowing them to roam outside. Remember that they are always exploring and tasting what is in their environment. Hermit crabs don't transmit any known diseases to us like turtles and reptiles that can carry Salmonella. It's always a good idea to wash your hands after handling crabs as a general practice anyway. Also be cognizant before handling crabs of what you may have been in contact with such as lotions for example.